After the expansion of the Chicago datacenter, it was announced that the Frankfurt datacenter would soon be receiving an upgrade to a 3-way server replication storage model. This would be a tremendous improvement to the service in terms of security and protection. It's a state-of-the-art, software-defined storage upgrade which, put simply, means that clients' data will be stored on three separate servers simultaneously. This means that if any problems or issues arise with one, there will still be two others working for that added reassurance. This fully stacked new hardware configuration guarantees high performance, and support is available 24/7 for your convenience. Your VPS can be deployed quickly and easily, allowing you to focus on getting the important stuff done. The CPUs in use at the Frankfurt datacenter are based on the Intel E5-2699v4 processor. This is the top-end product from Intel's Xeon range and boasts a jaw-dropping 22 cores, a base clock speed of 2.2GHz, 55MB of cache and a 145 watt TDP. This kind of power is priceless for a datacenter with enough memory bandwidth and general size to get a lot of work done. With this processing power, the Frankfurt datacenter offers the absolute fastest speeds that money can buy, so you can be assured that systems will be running as fast as systems can run at all times. In a time where data traffic is at an all-time high, platforms demand more and more from the processors that they run on, so we have spared no expense to ensure our processing power is fuelled by the best hardware on the market, so that our service to you remains at the forefront in the industry. The ever-increasing need for greater speed and capacity never goes away, and while many enterprises are still rolling out 10Gbit network performances, Frankfurt offers a 40Gbit one. Data traffic will never stop growing, and forward-thinking network architects are seeing the needs of the future. 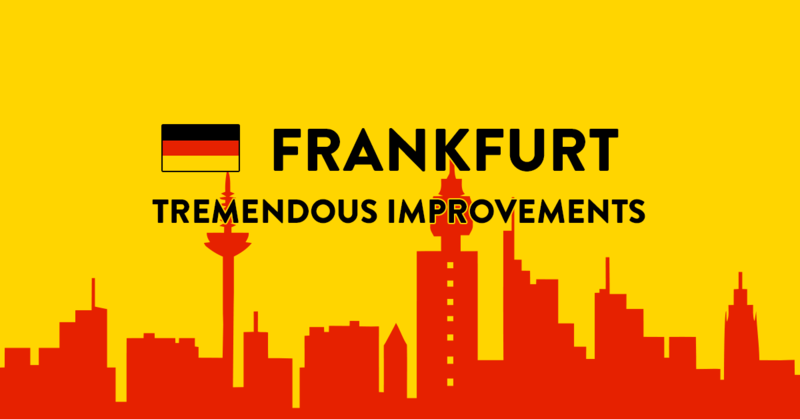 It's important to stay a step ahead of the continuous traffic onslaught, and Frankfurt's network capabilities are well equipped for the foreseeable future. As cloud storage and services, streaming demands and other such bandwidth-heavy data hogs continue to rise in prominence, expect networking needs to increase. But for now, Frankfurt offers VPS networking speeds that are more than sufficient for the vast majority of needs. The flagship VPS Features of the upgrade to the datacenter in Germany is the installation of the fully equipped 3-Way server replication system. This is backed with state-of-the-art SSD technology that goes another step in ensuring the fastest and most reliable virtual servers money can buy. 3-Way storage is far safer than the alternative - a RAID system only stores data on a single server, making it vulnerable to unforeseen issues or faults, and liable to be subject to periods of downtime whenever there is a server problem. With 3-Way server replication and 100% SSD hardware in place, we guarantee 99.99% uptime, consistency of performance level across the board, and 24/7 technical support to provide assistance should you need it. We don't just talk the talk; we walk it. We will always go the extra mile to ensure your experience with our hosting is as positive as humanly possible. We aim to make VPS hosting as user-friendly as possible, so you can concentrate on getting your work done without encountering issues with the hosting platform that slow down your productivity. Another great feature we offer is the range of easy-to-use online tools, straight from your dashboard. Once you have an account with us, you will have access to these tools to help manage your VPS. If you are already a customer connected to the Frankfurt datacenter in Germany, you will need to migrate on the service page in order to take advantage of the power of our new platform. Our intuitive online tools will help guide you through this, and there will be only a short period of downtime as the migration is executed. Once the migration is complete, you will instantly notice an incredible performance increase from what you are used to. So don't hesitate to make the transition, and see what our superb new upgrade can do for your VPS. This amazing new level of performance is now made available across Europe if you take advantage of our new platform for your VPS plans. You can host from the Frankfurt datacenter in Germany for as little as $0.006 per hour, and let our state-of-the-art systems give you hosting capabilities that are second-to-none. Hosting plans start from as little as $5 per month, so you won't have to break your budget to take advantage of this new, improved system across Europe. With the great news of this major upgrade to the Frankfurt datacenter, let us add that more locations are in the pipeline. A brand new, fully-equipped and top-of-the-range datacenter will be opening very soon in Hong Kong, so expect our world class servers to be available in Hong Kong in the very near future. All the same features, all the same guarantees, and all the same support will be part of the package for customers in Hong Kong, so keep us in mind for your VPS needs as you won't find a better service across the board anywhere else. And there are plans for datacenters in a number of other new locations in the near future, so watch this space. If you are interested in coming on board with our VPS hosting platform, feel free to browse our hosting plans and see which works best for you. Alternatively, please don't hesitate to make contact with us right away. If none of our standard hosting plans meet your needs, we would be happy to discuss the option of custom VPS plans that would suit your very specific requirements. Simply get in touch via our contact page and one of our helpful agents will be on hand to identify what your key requirements are and discuss how we can serve you in the best possible way.